Today was a good solid day! Although I didn't get to ride with PIC (she's buying a house and also had to fulfill some civic duties), and though the weather looked ominous, I just sucked it up and got on with the day. The day started with the craziness of raising two girls, a puppy, and a mom who didn't want to get out of bed. Getting the girls dressed (seems like such an easy task doesn't it?) and fed, lunches made, homework checked, backpacks ready to go, puppy fed and taken out, oh....and I need to get ready too! Somehow I fed myself, dressed, packed for horrible weather on the bike, printed out my workouts, pumped my tires, dropped the girls off, packed the car, dropped the puppy off (doggie day care is the best thing ever - see picture below), and got to the pool. By 9am. It was cold this morning - my thermometer only read 34 degrees?! Another WTF for the forecasters - it was supposed to be a sunny 54 degrees. I had to deal with my swim first but I was already thinking about moving the ride indoors. I needed to do some hill repeats and that means, well, heading to the hills - and it's colder up there. But the trainer for this workout? Ugghhhh. I would have to make the decision after my swim but I did need to focus on my "marker" swim. This is the swim I do every couple of weeks to see where I'm at, if I'm improving, if I'm tired, or just plain sick of the pool. I've been feeling strong so who knows what that will bring!! The set is 100s on 1:40 in the meter pool for 50 minutes. Pretty much as fast as possible the entire time. Last time around, I managed 1:19s. A couple of 1:20s thrown in for good measure. I was just hoping to match that today, I've been tired - on the last little push before Wildflower - so really, it could be faster or slower. Pleeeaaassseee let it be faster!! First one....1:16. Ouch. That hurt. Second - 1:17. Holy Hell this hurts. Third 1:18, dear God I have 27 left. But then I settled into the 1:18 pace. And just started knocking them down. One after the other. A couple of 1:19s thrown in for good measure. The last ten were a struggle as they always are but I was determined to not let the pace slip. Phew. Got 'er done!! Quite happy with that set! Somewhere around number 12, I noticed that it was getting a bit lighter outside. So I was hopeful that it was getting warmer and that I would be able to ride outside. It had warmed up....to a balmy 44. Well, I'm going for it. I knew better than to make the same mistake as last week - rode too high and not enough clothes for the descent - I had mucho layers and I was going to put them all on. If I was overdressed? Great - I'll need that for the possible heat at Wildflower. I changed my warm-up around to stay lower and eventually made it up to Deer Creek Park where I started my intervals. I was a bit overdressed so I took off one layer and put on my regular gloves. Today's work was low cadence with a higher heart rate than I normally ride with!! Sometimes I have a hard time hitting the higher heart rates but today was no problem. I was within my range in a minute. 14 minutes later....done with the first one. I felt good! It was tough but I could've kept going! A 6 minute descent (a bit chilly) and I was at it for the second one. Oh, the legs started barking right away. But I told them to shut up and push/pull. Second one done and right in my range. Yeah! Last one went the same way, I was tired but could've kept going. I put on another layer and my warmer gloves for the way down, got chilled and bee-lined it for my car. Since January, I haven't been setting my watch to view my watts during the intervals because, well, sometimes the truth is just depressing. But I was curious after the ride. I felt solid and strong.....hmmmm. So I checked right away, and I liked the numbers that I saw. I wanted to check with Coach first to get his thoughts but I was excited!! I knew I had a good day when I was driving home and doing 53mph in the left lane. Oops - sorry to the guy behind me. I was quite relaxed and tired.....in a good way. An easy jog on the tready while the girls did homework, pick up the doggy, make dinner, do dishes, answer emails, and a blog post? Yep. A good solid day. Sounds like a great day to me, heck everything you did before 9am is an accomplishment! I love that mellow contented feel after a good workout, just relaxed and enjoying life. 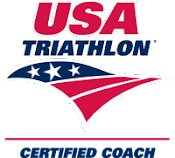 Swim, bike, AND run on the same day? Your schedule is just INSANE! And as always, I am extremely jealous that you get to train full time. 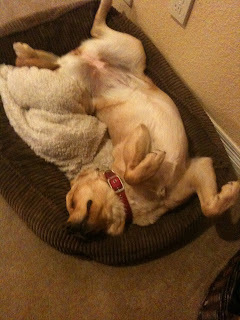 Love that pic of Kona - that's how *I* feel after a good hard day of training! Silly Kona Dog. Great job on those efforts, sorry I couldn't be out there with you, believe me, I wish I was!